Day and night, The Sundial Restaurant, Bar & View is one of the most spectacular ways to see Atlanta...a memorable experience any way you look at it. 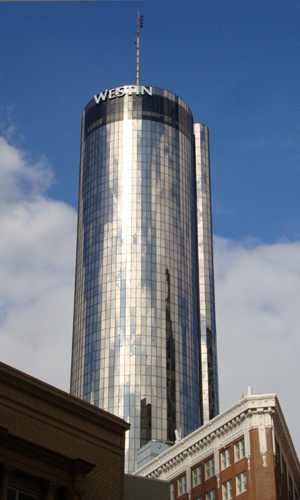 The capstone of the Westin Peachtree Plaza Hotel, the tallest hotel in the western hemisphere, The Sundial sits 723 feet atop of John Portman’s cylindrical mirror masterpiece…a brilliant diversion from his better-known 1970s concrete Atlanta architecture. 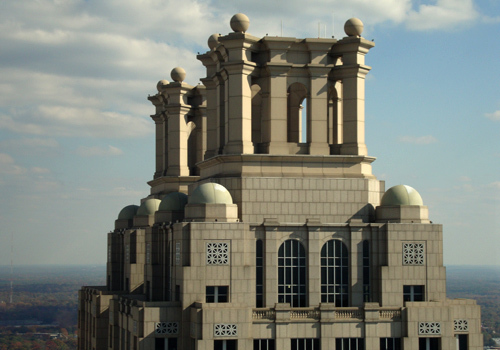 Following the Atlanta Tornado in 2008, the Westin underwent a significant renovation (including the replacement of all 6,350 reflective windows of the building's exterior) and today is, as it had been, one of downtown's most visited luxury hotels. A couple of months after I moved to Atlanta in 1987, I took a date to the Sun Dial Restaurant followed by a horse-drawn carriage ride through downtown Atlanta. It was a romantic, truly delightful evening for two 20-something college sweethearts. The Sun Dial has since been one of my favorite dining destinations in the city. 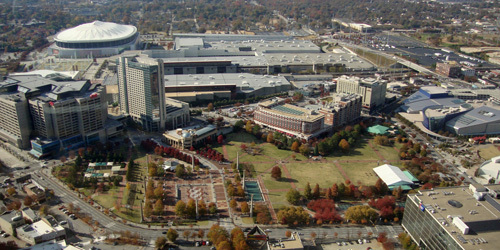 Yes, I have several favorite Atlanta eateries, but I've actually dined at Sun Dial more times than I can remember, so that's saying something. Come to think of it, I've been a couple of times since returning to Atlanta a few months ago and I even dined there when I lived in Washington, DC, while on business or pleasure travel to Atlanta. It's great for a special occasion and it's the perfect place to bring visitors, especially if time is tight to show off the city. Aside from the incredible views, the food is excellent. Not exactly what you would expect from a popular tourist destination, right? But, the Sun Dial's Executive Chef is a true culinary master. My most recent visit was for Thanksgiving Dinner, I didn't have to cook and my out-of-town guest was entertained the whole day. My appetizer was the most delicious, tender, savory duck confit I've ever had…I wanted more of it for my entrée and dessert! We both had a traditional turkey dinner entree, which I would venture to say probably rivals your grandmother's home-cooked bird. Dessert was a trio of saliva-inducing flavors, the obligatory chocolate offering being one of them. The portions of every course were more than generous…no one left the table hungry. The service, matching my memories, was superb. Minus the misplacement of a garnish on one of our pre-dinner cocktails, our server was attentive throughout the meal…we were not rushed, we were not annoyed, we were encouraged to relax and enjoy ourselves…it was the perfect holiday meal. The restaurant seating areas, an outer and inner ring, revolve 360 degrees every hour. Given the fine dining nature of the restaurant, you'll definitely have time for a full revolution, maybe two. Personally, I recommend making your reservations for 45 minutes to an hour before sunset. That way you will see the city in daylight as well as its twinkling night lights all in a single visit. The Sun Dial Bar is the upper most level in the hotel and overlooks the observation deck and the Sun Dial Restaurant. It too revolves 360 degrees, once every 35 minutes, and has the same incredible views of Atlanta's skyline and neighboring areas. On Wednesdays and Thursdays the Mose Davis Jazz Trio performs on the bar level, which adds to an already enjoyable experience for guests enjoying a libation in the bar, taking in the view from the observation deck, or dining below in the Sun Dial Restaurant. 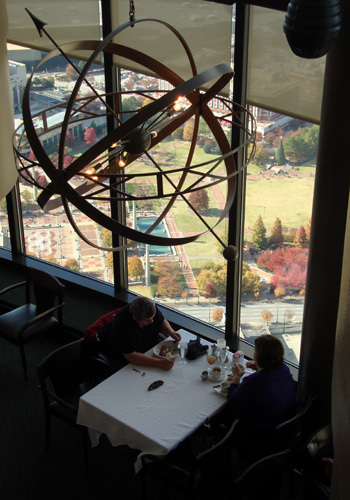 If you're not particularly hungry or are on a quest to find your favorite view of Atlanta's skyline, you can opt for the scenic ascent to The View, the observation deck at the top of the 73-story silver cylinder, situated just above the Sun Dial Restaurant and below the Sun Dial Bar. To get there, take one of the two exterior elevators, illuminated with brilliant blue lights, for an 85-second, narrated trip to the top. If going for the view only, there is a nominal fee for the round-trip ride, but it's free if you're going to the bar or restaurant. There are telescopes, free of charge, which you can use to zoom in on objects of interest. 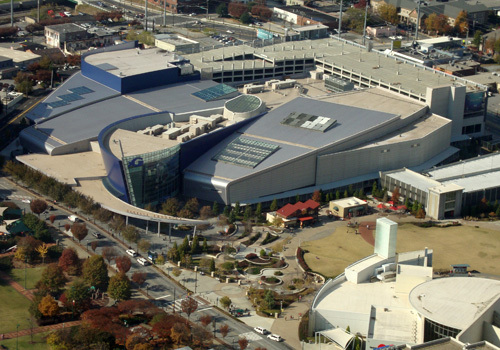 You can see the crowds in Turner Field; a sizable portion of Stone Mountain; that from above, the Georgia Aquarium looks like the Millennium Falcon; and you just might be able to see a few hotdog-eating diners at The Varsity, an Atlanta landmark that I'll blog about soon. On a clear day, and there are a lot of those in Atlanta, you can see the homes, building, and parks where millions of Atlantans live, work and play. Adorning the interior wall of The View is a "History Wall" with photos and displays that have lots of fun facts and tidbits of information about the city and the views from platforms on the observation deck. If going to the Westin to go to The View, be sure to check their "upcoming events" page for a listing of early closures, which aren't frequent, to ensure you get to see it. Do I think I'll rise to the occasion of visiting The Sun Dial again? Absolutely, without a doubt, I will. 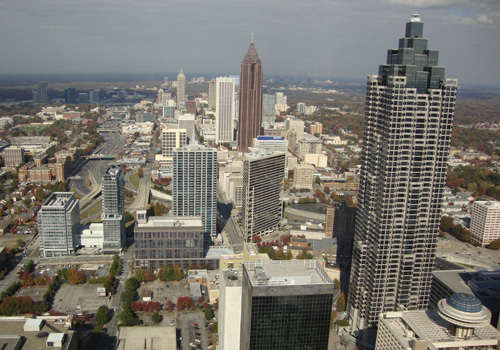 It truly is a fun, relaxing, and unique way to see and show off Atlanta...and the food and service are excellent too. I think I'll return each season throughout the coming year to see the city covered in velvety white snow, proudly showing its bright and colorful spring flowers, comforted in its lush green summer blanket of trees, and again showing off its vibrant fall foliage. Cost: Varies depending on meal, drinks, or view only.